And to think, before I started blogging, I had about two pink (and zero orange or yellow) things in my wardrobe and now ... now I feel weird when I don't have some sort of punchy berry or citrus hue in my outfit. So for this last day in March, I present you with "fruit punch." Thank you, fellow style bloggers, for inspiring me to venture outside my sartorial comfort zone. To think, I may have yet to discovered the visual joys of pink! I remember loving this large houndstooth print skirt when I first saw it! Love it on you. I used to not have very much pink either! Mostly because my favorite color used to be green but it's changed into pink while I have been blogging! I still say my fave color is blue but I seem to wear a ton of citrus and berry hues nowadays. I adore orange and pink! I used to hate any shades of pink, but I really am starting to like it, especially paired with orange. Great combo that fashion bloggers have definitely influenced. Red and pink too - a beautiful color combo IMO and one I would have never tried before blogging. Adorable! I find myself drawn to monochrome outfits because they feel so polished, for some reason. And this color of pink looks really good on you! Although some may say the star of the show is the skirt - super gorj, btw - I think the quiet understudy steals the spotlight for me. That top! The subtle color-block of the collar. Perfection! Love both the top and the skirt, and they are perfectly paired! Oh geez. I need this color combo in my life. So punchy and gorgeous. I love seeing you in brights without navy, black, or white to ground the colors. Such a refreshing, splashy, springy look! 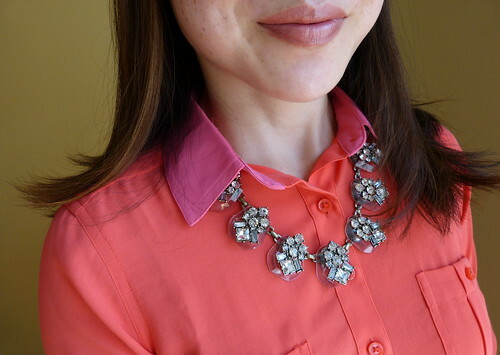 Going to my closet and scouring for corals and pinks this afternoon! It's spring - gotta go for those full-punch colors! Pink looks great on you Lisa! I love that top & skirt. I need to add more of it to my wardrobe. Just purchased some pink shorts. Love the pink and peachy pink together! I also love how your hair flips up at the end! How in the world do you do that?!!! I can never get it to stay flippy for more than 20 minutes. Houndstooth ! pink ! two of my very personal faves - you look awesome. That skirt is gorgeous and looks great on you! Such a cute look yet sophisticated too! Love that skirt! I think this skirt is the first post of yours that I commented on. I still love this skirt and I also love bright pinks. This is one of my fave print/color combos on a piece - I don't think I'd ever give this pretty skirt up! This is a gorgeous outfit and a gorgeous color on you! Pink and coral are fantastic on you my dear. Wear them often! So gorgeous! This color combination is fun and definitely something I would wear :) I, too, am a fan of "fruit punch" colors! Ahh, where would we all be without style blogging? Let's clink our virtual glasses: "to pink"! I love these fruit punch colors on you--it's definitely a good addition to your closet!! I love pink. I love orange. Pink and orange together? Yes, please! I love that pencil,skirt. You look lovely! I always look at the outfits I put together and think to myself - "would I really have worn this before getting into blogging?" Honestly, most of the time, I don't think I would have. It's way more fun getting creative, isn't it? I love the top and the punch of bright, especially at this time of year! Absolutely! I'm way more adventurous towards fashion now - it's fun! What fun and classy brights! I really love that skirt! I had literally no accessories before blogging either - guess I've made up for it! Pink + orange = stylish and happy Lisa!! Your blog was recommended by Lauren from Style of One's Own, and she mentioned that you also discussed Asian-American body issues in your posts. From what I've seen of your blog so far, you also have an amazing sartorial eye. 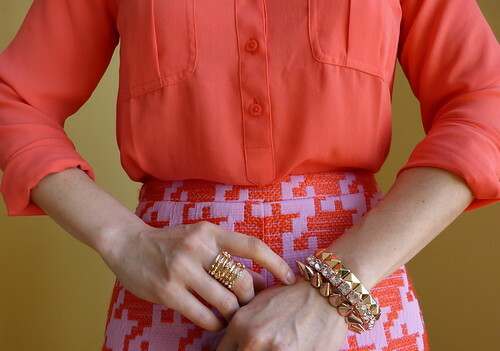 Pink and orange seems overwhelming at first thought, but this look is perfect for a summer day. Pink is a wonderful colour , but I have never thought to wear it with orange. The two go very well together! Nice! Also love the shoes, can you tell I am your biggest shoe fan?